Of all the desperate and futile attempts at revisionist history, few are as careless as the attempt to destroy the reputation of one of the finest Supreme Court justices this country has ever produced. Now comes another volley. 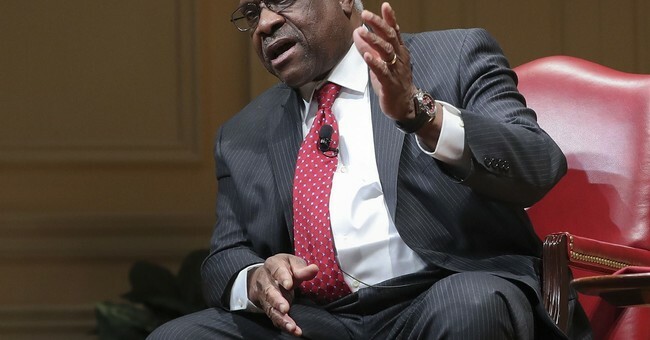 New York magazine has assembled "The Case for Impeaching Clarence Thomas." The author is longtime anti-Thomas journalist Jill Abramson. For more than 4,000 words, Abramson labors to relitigate Thomas accuser Anita Hill's dramatic loss in the court of public opinion. According to one poll at the time, 58 percent believed Thomas; only 24 percent believed Hill. Justice Thomas has been a distinguished member of the Supreme Court for more than 26 years now. In the years since, Abramson has assembled ... well, nothing. Meanwhile, the case against Hill's unproven charges has grown only stronger, and Abramson's record of objectivity -- if there ever was one -- is evermore tattered. Liberals like her think you should impeach someone for allegedly lying under oath -- but not if the person's name is Bill Clinton -- and then lean heavily on "alleged" for protection. The rationale for attacking Thomas all over again was the Harvey Weinstein expose. But just since then, Abramson has managed to hurt her own cause again. She has no credibility in this discussion. Indeed, she's on the wrong side of it. In October, the Washington Post reported that as executive editor of The New York Times and deputy to Michael Oreskes, she did nothing to stop Oreskes from allegedly sexually harassing a female news aide in the Washington bureau.